SYRACUSE – The Wawasee C team has already had a terrific start to its 2014 season and the Warriors continued that success in big way on Tuesday night. Wawasee’s offense went into overdrive in the fourth inning against Plymouth. The home team blitzed the Pilgrims with 16 runs in the frame to highlight a 20-7 victory and remain unbeaten. Fours were wild on the scoreboard in a 4-4 tie game entering the fourth inning. Plymouth scored twice in the top of the inning to take a 6-4 lead and some momentum into the bottom of the fourth. Wawasee had just scored three runs in the third, which was apparently just a forewarning of the offensive outburst to come. Wawasee’s fourth inning explosion started with Rhett Coblentz. The freshman celebrated his birthday on Tuesday and certainly made a party out of his fourth inning opportunities. 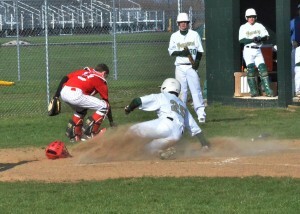 Rylan Kuhn (25) slides in safely at home plate in the third inning of Wawasee’s win over Plymouth. Coblentz was the No. 9 batter in the lineup, but led off the inning with a single and was batted home a short time later. Coblentz made a habit of getting on base in the inning as the only Warrior to get three at-bats in the frame. The birthday boy went 2-2 with a walk, two runs scored and a stolen base to boot. Of course there was more than just one player making waves in the inning for Wawasee. While Coblentz’s two hits led the team in the inning, the first 12 Warrior batters reached base in the inning. As much as Wawasee deserved credit for the offensive success, Plymouth simply gave the Warriors no choice but to score. 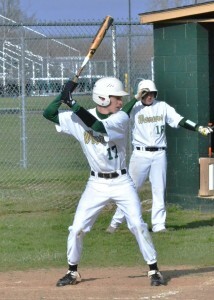 Caleb Glon prepares for a pitch on Tuesday night. Glon walked twice, reached on an error, scored three runs and stole two bases to help his team beat Plymouth 20-7. There were only four hits total for Wawasee in the frame, two from Coblentz and one each from Rylan Kuhn and Gavin Bontrager. Wawasee was walked nine times, had two batters reach on errors and one hit by a pitch. Kuhn was one of four Warrirors to score three runs in the game and he also stole three bases. As a team, Wawasee had seven stolen bases. Plymouth finally got itself out of the inning after two pitching changes and even managed to score a run in the top of the fifth. Despite that run, Wawasee’s lead was more than enough to have the 10-run mercy rule come into play and end the game. 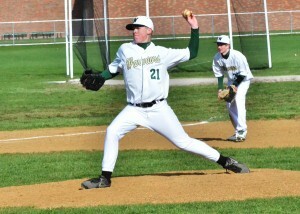 Bontrager pitched all five innings for the Warriors, recording four strike outs along the way. Wawasee had a few mental mistakes throughout the game, mostly when it came to running the bases, but ultimately the Warriors did what they had to do and took advantage of Plymouth’s mistakes. Wawasee head coach Ryan Christner was all smiles after the game. Wawasee remains unbeaten this season with a record of 3-0-1. The Warriors will travel to Warsaw to take on the Tigers C team next Tuesday. 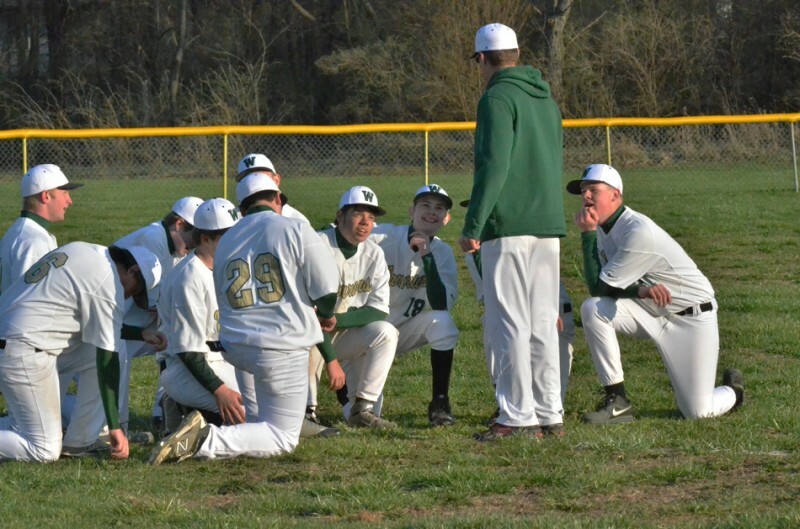 Wawasee C team head coach Ryan Christner talks to his team after its big win over Plymouth. The Warriors C team is now 3-0-1 on the season.